LAST MONTH, I discussed shots where the cue ball was frozen to the rail. This particular situation can be troublesome for developing players because of its unfamiliar territory, so you don't know what to expect. This month, I'd like to another look at the unknown - maybe not with a particular shot, but with your approach to the game as a whole. The key to playing to the best of your abilities is reaching a certain comfort level. You want to be confident that you can handle any shot or any situation. For example, in a competitive environment, nerves are bound be involved, but this feeling can help if that energy is used to maintain focus on the end goal. When it comes to specific are game, ask yourself what you want to accomplish. Obviously not everyone who picks up a cue has the goal of being the best in the world. Still, if you want to improve, make a short-term goal. If you have run four balls in a match, aim to run five. If you've run five, shoot for running out from the break. When it comes to improving in specific areas, you can't be afraid of the unfamiliar or uncomfortable. Some players have a tendency to avoid their weaknesses, instead of spending the necessary time on improving those areas. For the sake of this discussion, let's build off last month's drill. After you can consistently sink the 1 ball in the corner and side pockets, try the drill shown in Diagram 1. Here, the cue ball is frozen to middle of the head rail. 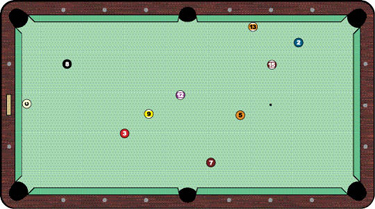 Throw a few balls on the table and try to sink them in the far corner pockets. You'll quickly realize how difficult this can be. Some of you might not be ready for this, but if you set goals for incremental improvement, you'll eventually be able to handle something like this drill. At that point, you can see that something that was uncomfortable is now a part of you game.